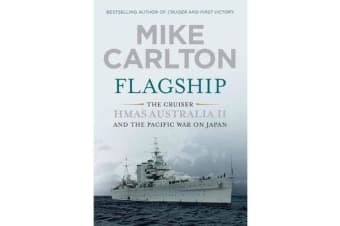 In 1924, the grand old battle cruiser HMAS Australia I was sunk off Sydney Heads. Once she had been the pride of the navy and the nation. She had saved Australia from an attack by a German squadron in the Pacific in World War I. But after the war she was obsolete, and a victim in the race to disarm after WWI. It was a day of national mourning when they blew the bottom out of her; she went to her sea grave smothered in flowers and wreaths sent from around the country. Four years later, in 1928, the RAN acquired a new ship of the same name, the fast and modern heavy cruiser HMAS Australia II. During the Depression of the early 30s the navy virtually rotted on the beach – until the world so belatedly awoke to the menace of Hitler’s Germany. Australia saw her first action of World War II against the Vichy French, during the abortive 1940 attempt to install the young General de Gaulle as free French leader in Dakar, West Africa. She patrolled the North Atlantic on the lookout for German battleships and – in a feat of amazing seamanship – rescued the crew of a downed RAF Coastal Command aircraft in the teeth of an Atlantic gale. She was later bombed by the Luftwaffe in Liverpool. Australia returned home to join the war against the Japanese, as the flagship of the RAN. Melbourne, Sydney and Brisbane were flooded with Americans ‘overpaid, oversexed and over here’. Many Australian servicemen resented the Yanks and their magnetic attraction for the local girls. The so-called Battle of Brisbane in 1942 was two days and nights of out-of-control brawling and rioting, with the Americans on one side and the Australians on the other. One Australian was killed, and dozens of other men were wounded. The whole affair was heavily censored. In March 1942, the ship was stunned by a murder. One night at sea a sailor, Stoker Riley, was found stabbed and bleeding to death on the fo’c‘s’le. Before he died, he named his two attackers, fellow stokers Gordon and Elias. They’d tried to kill him, he said, because he’d threatened to expose their homosexual activities in the ship. At a hastily arranged court martial, Gordon and Elias were found guilty and sentenced to death under British Admiralty law. That provoked a major constitutional row, because the death penalty did not apply in Australia. Eventually they were reprieved. Only weeks later Australia fought in the Battle of the Coral Sea near Papua New Guinea, the first sea battle to stop the Japanese advance in the Pacific. She was heavily attacked and bombed from the air but, with brilliant ship-handling, escaped unscathed. That luck did not last. In 1944 she took part in the greatest sea fight of all time, the Battle of Leyte Gulf, which returned the American General Douglas MacArthur to the Philippines. Australia was struck by a kamikaze bomber, killing her captain and 28 other men.